Google has announced a range of significant new updates to its Analytics product, all of which should help marketers to understand their individual customers at a deeper level. Below, we assess the impact each of these four enhancements will have on search marketing analysis. The ongoing implementation of machine learning into all Google products has benefited GA, with the addition of Analytics Intelligence a particular highlight from the last 12 months. Simultaneously, Google wants to provide site owners with insight into the impact of their marketing activities across all channels. This has always been the aim, but it is a challenging one from a tracking perspective. The partnership between GA 360 and Salesforce is a reflection of Google’s willingness to work alongside other companies to achieve this goal and ensure it keeps its dominant position. The four latest updates to GA all exhibit some elements of these trends, with machine learning and user-level analysis never far from the foreground. The underpinnings of the standard report dashboard have been adapted to include more insight into user-level behavior. This is a significant shift from the historical focus on sessions, as an individual user could have multiple sessions even within the same day. The implications of this hierarchical system (User>Session>Hit) were discussed in a previous post, where we assessed some common GA misunderstandings. Marketers will undoubtedly welcome the default option to analyze users alongside sessions and we should expect Google to continue improving the accuracy of user-level data. As it does so, more options for assessment and targeting will follow. Go to Admin > Property Settings in your GA account, then select the option for Enable Users in Reporting. 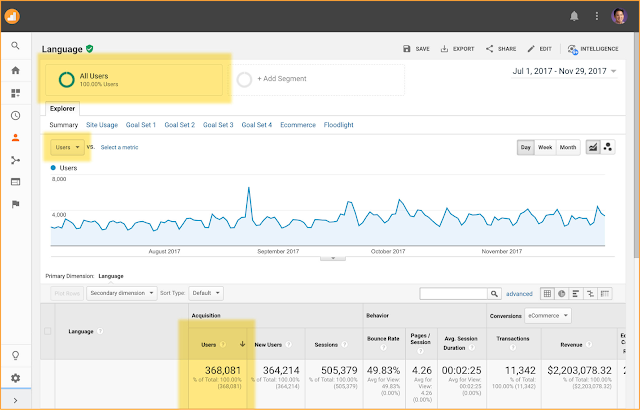 Combine with other (relatively new) features like Cohort Analysis to get a clearer picture of how groups of users arrive at – and interact with – your site. 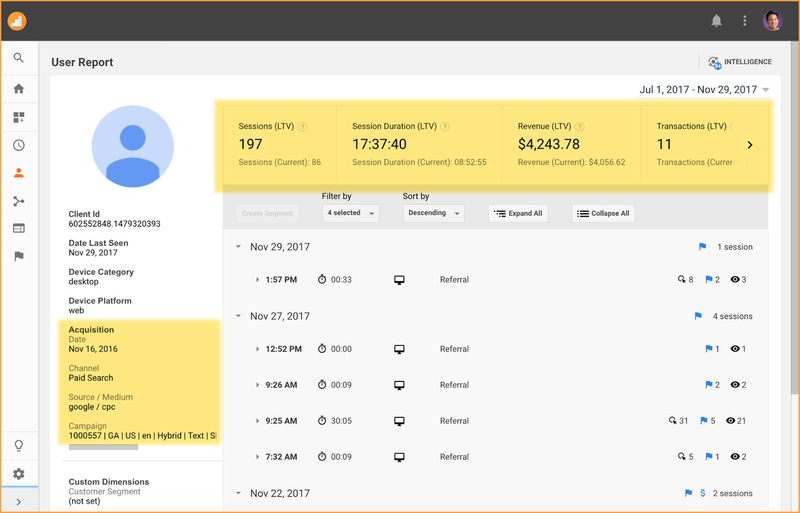 User Explorer, which allows marketers to isolate user behavior down to the session level, has huge potential as an analytical tool. It is already available in all GA accounts and draws its data from the lifetime of a user’s cookie. Google has recently revamped this feature with the addition of lifetime metrics and dimensions for individual users. As can be seen in the screenshot below, this is displayed in a dashboard that contains a variety of information about past, present, and predicted future behaviors. Taken in isolation, this level of granularity may appeal to little more than our curiosity. However, the ability to scale this and identify patterns across a large set of Client Id numbers could reap significant rewards for marketers. Once we group together similar users, we can tailor our marketing activities and messaging, both for prospecting and remarketing. Identify patterns in the channels that lead valuable clients to arrive at your site. This can be of use when prospecting for new customers who share the same attributes. Maximize the value of current customers with a high projected lifetime value, through remarketing and tailored messaging. This is a logical and much-needed update to Analytics, making it a particularly welcome addition. 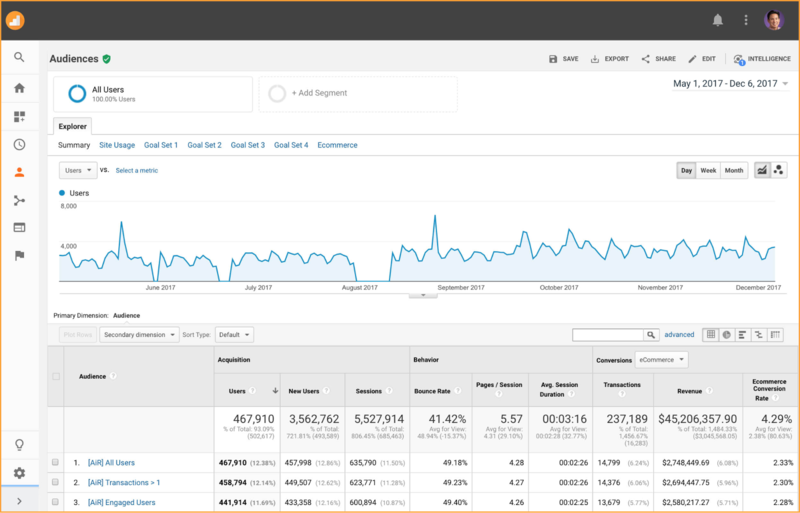 Users can now create audiences within GA and then publish them within the platform for analysis. Up to now, we have been able to create audiences and publish them to other Google properties, such as AdWords. This has been very useful for remarketing, but it was not possible to create a report for these audiences within GA. 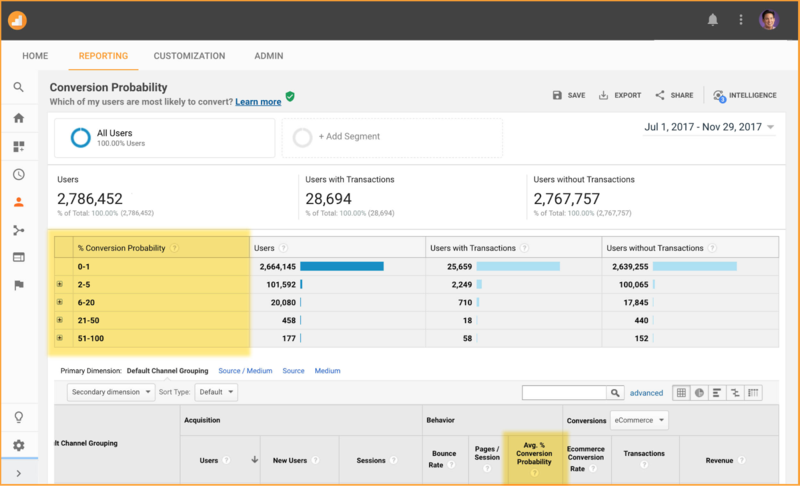 This new feature uses ‘Audience’ as its primary dimension and permits users to compare performance across different segments. For example, we could create an audience for customers that have purchased more than 5 times in the last 6 months, and compare this group with visitors that consume a lot of our content but do not make purchases. Create audiences based on the behaviors that matter to your business and monitor their interactions over time. These can then be compared to derive insights about the characteristics of our most valuable customers. Given that these same lists can be uploaded to AdWords, we can draw a more direct line from analysis to action. If we notice trends within specific customer groups that we would like to enhance or reverse in our GA reports, we can do this seamlessly by targeting that same audience group through AdWords. Use audience lists as the basis for conversion rate optimization tests. This is perhaps the most exciting of the four updates and has the highest potential to have a positive impact on marketers’ ROI. By analyzing your site’s historical data and automatically identifying the patterns between variables within sets of high-value customers, Google can identify the recent site visitors with the highest probability of a future conversion. This has been achievable in the past through a variety of means, notably through the use of Google Analytics Premium data, logistic regression analysis, and Google BigQuery. Many paid media management platforms also employ this type of machine learning to help with bid management, as does Google AdWords. However, by incorporating this technology into the standard Google Analytics platform, a much wider user base will now have access to predictive analytics about their customers. Combined with the updates listed above, we can see how this fits into the broader picture. Google uses machine learning to identify future customers, which site owners can then use to create audiences for analysis and remarketing. This feature is rolling out to all accounts in beta over the next few months, so it is worth looking out for. Identify the quality of traffic that is driven by your marketing activities. The ‘Average % Conversion Probability’ metric will reveal this within your Conversion reports. The advantages are clear: Marketers can create remarketing lists that target users who have a high likelihood to purchase and then reach those users through either advertising campaigns in AdWords and DoubleClick or site experiments in Optimize. Viewed together as a group of updates, the key takeaway here is self-evident: Google is at pains to use its machine learning capabilities to create a deeper understanding of individual users. The field of predictive analytics can be a particularly profitable one, especially for a company with targeting technology as effective as Google’s. The latest enhancements to GA should see these capabilities extended to a much wider audience than ever before.